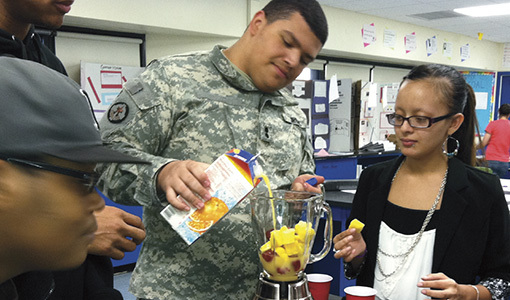 Community-service star Emily Frank, M15, gets kids excited about health. When Emily Frank was teaching life sciences in Vallejo, California, in 2008, she led her seventh-graders in an experiment to show how calcium strengthens bones. Inspired, her students wrote impassioned letters to pupils at another school about the importance of drinking milk. “I learned from my students that peer pressure is the strongest force on Earth and that kids actually care a lot about health, despite public perception otherwise,” Frank said. 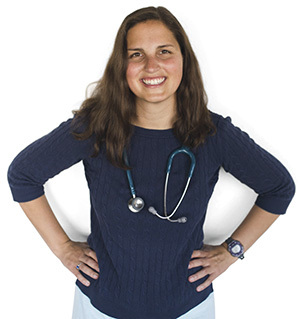 The ongoing program won Frank accolades—the Tufts Presidential Award for Civic Life, the Massachusetts Medical Society Scholar Award, and an Excellence in Public Health Award from the U.S. Public Health Service—and was the basis for an initiative she started in 2016 as a first-year resident in the Pediatric Leadership for the Underserved (PLUS) program at the University of California at San Francisco: Dubbed Summer Health Bridge, it involves students in community wellness projects. Frank isn’t the only one who believes it. In November, the Association of American Medical Colleges honored her with Organization of Resident Representatives Community Service Award, which recognizes those who have gone above and beyond the requirements of residency training to help improve nearby communities. She also received the Anne E. Dyson Child Advocacy Award from the American Academy of Pediatrics. Now a third-year PLUS resident, Frank has trained 16 Oakland-based health centers in the HIP and Summer Health Bridge curriculums. After residency, she plans to work at the intersection of education and medicine: As a part-time educator, she’ll help school administrators establish healthier practices for the students; as a part-time clinician, she’ll encourage health administrators to promote public education.